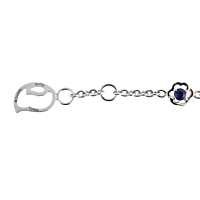 A delicately pretty Chanel Camellia sapphire diamond blue topaz white gold bracelet that features a larger Camellia flower that is set with blue sapphires, blue topaz and a round brilliant cut diamond, with 2 smaller flowers on either side set in 18k white gold. Ever since the brand was founded by Coco Chanel in Paris in 1909, Chanel jewelry has been synonymous with class and beauty. The iconic Chanel logo is one of the most featured designs throughout both vintage Chanel jewelry lines and the more modern staples. Its iconic logo is recognized around the world as one of the most revered status symbols and has featured prominently in the Chanel lines for the last six decades. Wearing Chanel fine jewelry elevates your entire look to a new level of sophistication. Whether you are a fan of classic vintage Chanel jewelry or prefer some of the trendier Chanel fine jewelry, there are gorgeous options for all styles. Chanel jewelry makes a beautiful statement of luxury and fine taste.